As celebrity engagement rings go, Gwyneth Paltrow’s is among the most discussed – not just because this gorgeous ring is a famous one, but because it is the symbol of a relationship that’s often rumored to be on the brink. The ring features a magnificent Asscher-cut center stone showcased by a delicate micro pave halo, which Gwyneth often wears with a matching micro-pave band. Gwyneth Paltrow and her husband, Coldplay’s lead singer Chris Martin were engaged in 2003 and wed in a private ceremony the same year. They have two children. Like Gwyneth Paltrow’s engagement ring, this custom design from Brilliance has a gorgeous vintage look. The stunning Asscher-cut diamond at its center is perfectly showcased by a sparkling halo, and more diamonds twinkle along the shanks. Born September 27, 1972, Gwyneth Paltrow has been appearing in films since 1991. She gained worldwide fame through her performance in the 1998 production Shakespeare in Love, winning an Academy Award for Best Actress as well as two Screen Actors Guild Awards and A Golden Globe Award. In April of 2013, she was named People magazine’s Most Beautiful Woman. Everyone loves Gwyneth Paltrow, and her relationships have always been the subject of scrutiny. Following notoriously high-profile romantic relationships with actors Brad Pitt and Ben Affleck, she met and married Chris Martin. As one of America’s greatest style icons, it’s not at all surprising that Paltrow is the owner of her own lifestyle company and the face of top fashion brand Coach. She has also authored two cookbooks. Gwyneth is also a Save the Children ambassador, and is on the board of the Robin Hood Foundation, among other charitable endeavors. Did you know that Gwyneth Paltrow is Blythe Danner’s daughter? Her mother’s career spans roles on Broadway as well as appearances in movies. Acting runs in Paltrow’s family, as does directing; her father was producer and director Bruce Paltrow. What Our Experts Have to Say about Gwyneth Paltrow’s Engagement Ring. Gwyneth Paltrow’s engagement ring matches the actress’s sense of style perfectly. Its Asscher-cut center stone is uniquely beautiful, and the overall look is one that is at once glamorous and sophisticated. Although this ring was designed over a decade ago, its look isn’t at all dated; instead, it is beautifully timeless, ensuring that this particular celebrity engagement ring will never lose its appeal. 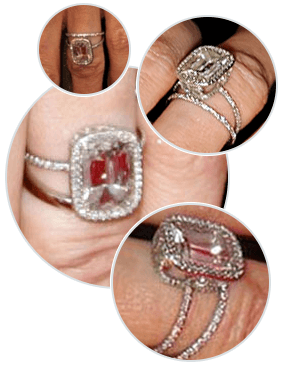 Celebrity engagement rings like Gwyneth Paltrow’s almost always come with massive price tags. If you’d like to enjoy incomparable style that suits your budget, consider working with the jewelry experts at Brilliance. Whether you choose an Asscher-cut engagement ring from among our existing designs or prefer to use our online design tool to create a look that gives a nod to Gwyneth’s ring while symbolizing your own lasting love, you are certain to enjoy the process as well as the beautiful, sparkling results. Shop our collection or design your own Hollywood engagement ring. We have the largest selection of loose diamonds anywhere, making it simple for you to create a sparkling look that’s worthy of the lasting love you share.